An effective resume can be a tricky document to create. It is often your first introduction to recruiters, and as such it must stand out. However, if it doesn’t adhere to certain professional standards, you may not get the right kind of attention. You have a very small timeframe to attract a recruiter’s attention and hold onto it long enough for your information to lead to an interview. You can find the balance between creating a visually-tempting document and a resume that has the right professionally attractive design with our InDesign resume templates. We offer guidance for the best information to include, formatting that is easy to scan, and tips about how to make a great first impression. Access the best tools to create a resume that opens doors to interviews with our wide selection of templates. 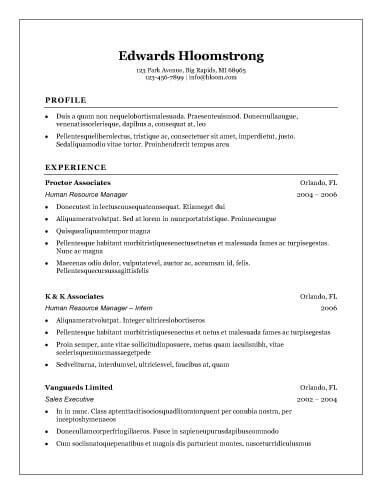 Why Use InDesign Resume Templates? A classic resume format may be appropriate if you’re applying for a position in an accounting firm and most other professional businesses. However, there are some industries where it is important to draw attention to your creativity. With the layout methods and digital features available through InDesign resume templates, you have the design tools at hand to showcase your skills and abilities without sacrificing professional style. Resume design has naturally evolved over the years, resulting in the sleek, minimalist look of today’s contemporary resume templates. Using a modern format has several advantages, including the chance to show your tech skills and your ability to connect with the rising consumer generation. Modern InDesign resume templates are easy to read, showcase your credentials, and are easy for application tracking software to scan. If you aren’t sure which format is best, you can choose a traditional template. These layouts are comfortingly familiar, easy for recruiters to review, and nearly always visually appealing, if only because they have a classic style. 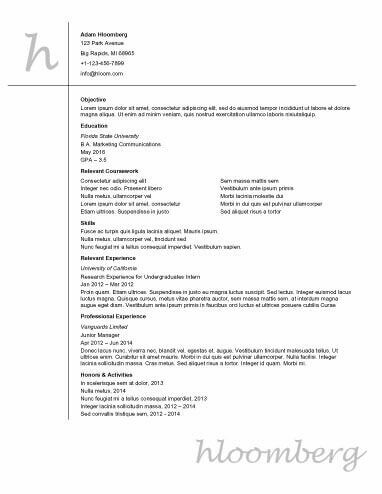 Turn it up a notch by adding a unique color scheme or deliberate font choice with the tools of an InDesign resume template. As an entry-level candidate, you must have a resume that captures the attention of recruiters and convinces them that you have the qualities they desire. Without a lot of professional experiences, you must prove your potential. There are steps you can take to showcase relevant experience when you don’t have actual job experience. Our entry-level examples of InDesign resume templates walk you through this process. There are some instances where two or more pages are appropriate, but most of the time, it is a better idea to stick to a concise format. We offer several templates with the one-page format, so you can choose the template most appropriate for the job you hope to obtain. Take a look at what these templates can offer you. If you’re looking for a position in industries such as visual arts, marketing, home design, or fashion, your resume should give a glimpse of your creative abilities. Our creative templates are perfect for this type of personal document and offer you the chance to combine the aesthetic appeal of certain fonts, colors, and images to use the paper most effectively. Our InDesign resume templates are also effective if you need to create an online document. Avoid the most common mistakes as you begin your resume. Simple missteps, such as leaving typos in the document and focusing too much on duties rather than achievements, can derail your attempts to get interviews. 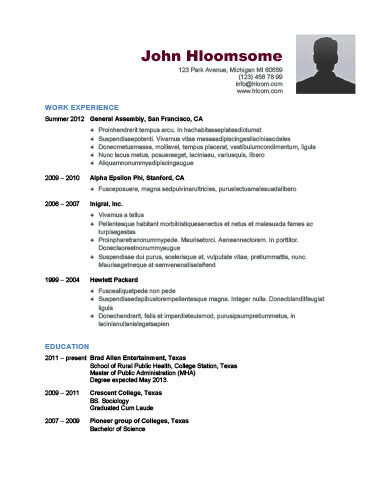 Our InDesign resume templates help you avoid these and other mistakes. Turn to our library of tools for guidance through the creative process and tips on the most effective resume writing practices. Use the following to guide you through vital sections. Display this at the top of your page, including your full name, your email address, and your phone number. Take a few minutes to be sure your email has a professional tone and avoid using outdated email addresses. Do the same for your voicemail greeting. The singsong voices of your children are perfect for many occasions, but probably not for an invitation to an interview. Most of the job-hunting advice you read these days will tell you to avoid an objective statement and advise you to use a summary statement instead. Be sure you understand the difference. Summary Statement: A summary statement focuses on what you bring to the table. It delivers a powerful introduction that includes your valuable skills and what you can offer an employer. This professional summary is most appropriate when you have a strong work history behind you. Objective Statement: This short paragraph tells a potential employer what you hope to gain while on the job. These statements are appropriate for jobseekers who are just entering the work field, people who are switching industries, and recent graduates without much work experience. This section should include details regarding your most pertinent skills. Most of the time, this list should include about four to six skills. Read through the job listing carefully, taking note of keywords that apply to your experience and using those keywords in your resume. Take time to tailor each resume to the position and company where you hope to get an interview. The work experience section of your resume is generally the longest section and the part of the document where potential employers will spend the most time. Be sure to include company names, locations, and length of employment. Underneath each of these subsections, use bulleted lists, using action verbs and measurable details. There are two basic sections under this heading: academic achievements and training accomplishments. If you graduated from high school, a technical school, or a university, include the names, locations, dates, and degrees you received. Under the training section, be sure to include additional certifications, completion of ongoing education, attendance at seminars, and similar courses.